This Gourmet Four Flour Blend revolutionizes gluten-free baking. 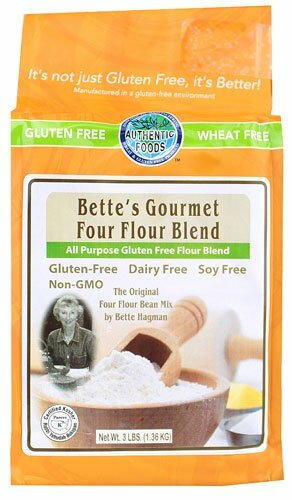 Developed by Bette Hagman, author of the book, "The Gluten-Free Gourmet Bakes Bread" claims this wonderful flour will exchange cup for cup with wheat flour. There is more protein and fiber in this blend of flour allowing you to take regular cake or cookie recipe and not have to make any changes or additions except for xanthan gum in most cases. Exchanges cup for cup with wheat flour (xanthan gum may be required). Adds more protein and fiber to baked goods. Also called Four Bean Flour Mix. If you have any questions about this product by Authentic Foods, contact us by completing and submitting the form below. If you are looking for a specif part number, please include it with your message.